It looks like Google is testing a new encrypted search in Google Chrome. Instead of the regular google.com which is used for search, many users of Google Chrome are reportedly being redirected to encrypted.google.com. Encrypted search provides end-to-end encryption between the user's computer and Google when they search for something. This will prevents a third party from eavesdropping on users and improve the user privacy. The encrypted search is available not just for web search, but also for blog search, real-time search, video search, news search etc. It is however not available for image search. The encrypted search itself is not new. 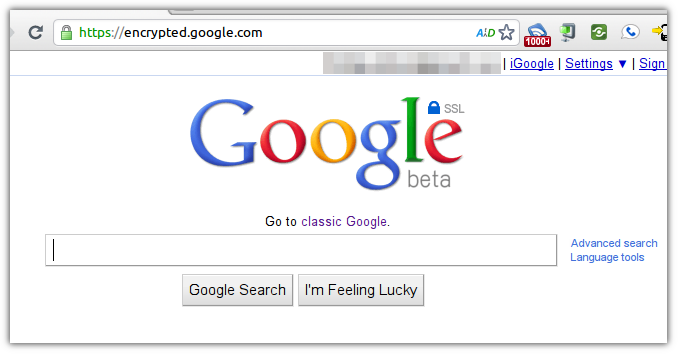 Google has been beta testing it for some time. However it is interesting that Google is now settings it as the default search for some Google Chrome users. This comes after only two days after Google accused Bing of cheating by spying on the Google searches by users. Yes, Bing was allegedly collecting information using Internet Explorer and Bing Bar. But I think it is not far fetched to think that Google may be planning to roll out encrypted search for everyone. Encrypting the search could maybe possibly make what Bing is doing ineffective. Another reason could be the increasing cases of governments spying on its citizens.